We’ve talked about the remarkable Solar Impulse aircraft before–it’s a mind-boggling vehicle that’s important for the future of flight and solar-powered product design. It just flew its first 24-hour non-stop flight, right through the night. Considering that Solar Impulse only took its very first test flight back in April, the fact it’s successfully flown under solar power through the day, and stored battery power through the night for a non-stop day-long mission is almost incredible. It’s a testament to the skills of the test pilot Andre Borschberg, and the design of the aircraft, with its 12,000 solar cells stretching over Boeing 747-sized wings. At 9 a.m. local time this morning at Payerne airfield, about 50km outside Switzerland’s capital Bern, the experiment ended with a successful landing after a flight lasting around 26 hours that peaked at an altitude of around 28,000 feet (8,700 meters). It’s concrete proof that the design works–the aircraft can really capture solar energy efficiently enough during daylight hours so that it can both power its propellers and fill its batteries so that the props can spin right through the night too. 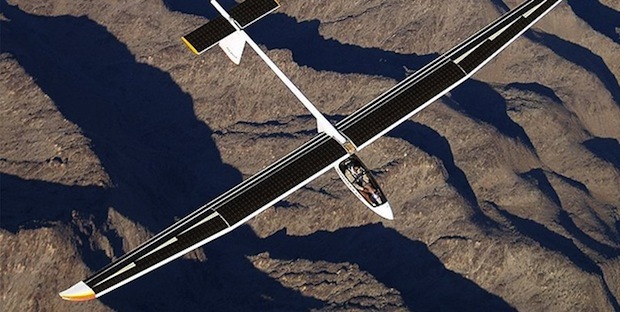 And this is an excellent thumbs-up for the project’s ultimate goal of flying around the world using only solar power. Next up, more flight tests, with longer endurance which will both test the vehicle’s systems, and the resolve of a pilot who has to sit in a freezing cockpit, monitoring the aircraft’s systems and managing it’s flight through the weather right through the dead of night. And after that, expect to see various of its experimental systems informing the research and development of solar powered and alt-fuel technologies.